Pat Leinen's career ended in 1992, not necessarily by the team's decision, but by his own, according to The Baltimore Sun. Playing at AAA Rochester that July, the Orioles sent him back to AA Hagerstown, The Sun wrote. Instead, he retired. "I wasn't going to try to convince him he's got an opportunity to pitch in the big leagues," Orioles assistant general manager Doug Melvin told The Sun. "He felt there were too many people ahead of him." Leinen ended his career that year in his fourth pro season. He made AAA Rochester, but he never made the majors. Leinen's career began in 1989, taken by the Orioles in the 29th round of the draft out of the University of Nebraska. He turned down a ninth-round selection by the Mets in 1988. At Nebraska, Leinen threw a complete-game, four-hitter in April 1988. The next April, Leinen threw another four-hitter - and received praise from rival coach Dave Bingham, according to The Lawrence Journal-World. "I told the team that's one of the best pitchers in the Big Eight," Bingham told The Journal-World. "He was a ninth-round draft choice last year. He can stuff anybody anytime. He was better than we could handle." 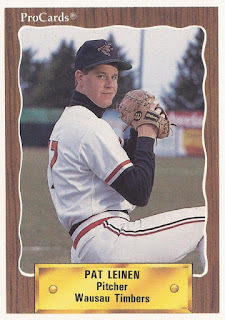 Leinen started with the Orioles at short-season Erie. In 16 outings, 15 starts, he posted a 3.55 ERA, going 2-9. He moved to single-A Wausau and high-A Frederick for 1990. He went 9-15 overall, with a 3.26 ERA. Leinen made AA Hagerstown for 1991. He improved to 10-6, with a 2.97 ERA on the year. Late in that year, he won five-straight starts. In 1992, Leinen arrived at AAA Rochester. He got into 17 games, eight starts, with a 3-4 record. He gave up six hits in seven innings of work in a June win. His career then ended the next month, short of the majors.